SALW control policy, DD&R policy, mine action, wartime sexual violence, design and implementation of training modules and curricula. Elvan graduated from one of Canada’s most innovative and interdisciplinary programmes, earning a Bachelor of Arts & Science Degree with a combined Major in Political Science and a Minor in Peace Studies (McMaster University). She completed her Master of Arts degree in International Relations at the Norman Patterson School of International Affairs in Ottawa, with a specialty in Conflict Analysis and Conflict Resolution. Elvan began her professional career at the largest non-profit youth organization in Canada (Junior Achievement) and worked for the Mine Action Unit at Foreign Affairs Canada prior to coming to BICC. Her focus has since been on building capacity for community-level small arms control and conducting research on small arms, DD&R concepts and practice, and wartime sexual violence. 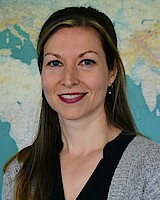 She has engaged in field work in South Sudan, Bosnia & Herzegovina, and El Salvador. Isikozlu, E., & Heinke, S. (Eds.). (2017, March). Fleeing Conflict—Trajectories of Displaced Persons (BICC Knowledge Notes series No. 2/2017). Bonn: BICC. Isikozlu, E., & Heinke, S. (Eds.). (2016, June). Networks of Organised Violence (BICC Knowledge Notes series No. 1/2016). Bonn: BICC. Isikozlu, E., & Heinke, S. (Eds.). (2015, June). Facing Organised Violence: Research Agendas and Conversion Potentials (BICC Knowledge Notes series No. 2/2015). Ashkenazi, M., Isikozlu, E., & Kösling, M. (Eds.). (2013, November). Smart Technology in SALW Control (Brief series No. 49). Bonn: BICC. Isikozlu, E., & Heinke, S. (Eds.). (2018, April). “Dirty Peace?” The Political Economy of Peacebuilding (BICC Knowledge Notes series No. 1/2018). Bonn: BICC.